We also have the BIGGEST forklift in the northern Texas region! We’re also setup for pick, pack and ship fulfillment solutions! 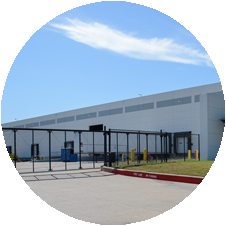 Our Dallas/Fort Worth, TX (DFW) warehouse (in Haslet) is just the right size, in just the right place, for just the right length of time. You don’t pay for space you don’t need; we’ll find you the perfect fit! Let us help diagnose your warehousing challenges, develop inventory management solutions and then make those solutions work where it matters – out there in the real world. 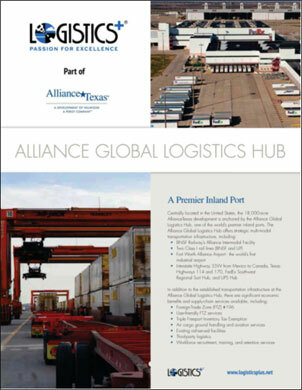 Our DFW warehouse is uniquely sized and equipped to move and store heavy-lift machinery and equipment. Pneumatic tire forklift with 62,000 lb. 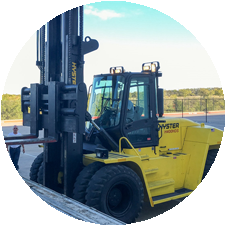 lifting capacity – the BIGGEST forklift in northern Texas! You can also contact us at 972.893.9695 or pricing@logisticsplus.net. 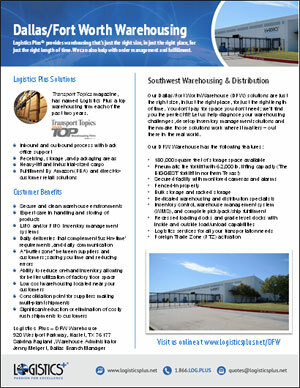 You can also download our DFW warehouse facility flyer and our current rate schedule below.